One of the benefits of spending a prolonged period in a new city is the ability to attend festivals and ceremonies as a part of everyday life, something that we don’t often get a chance to do as tourists. 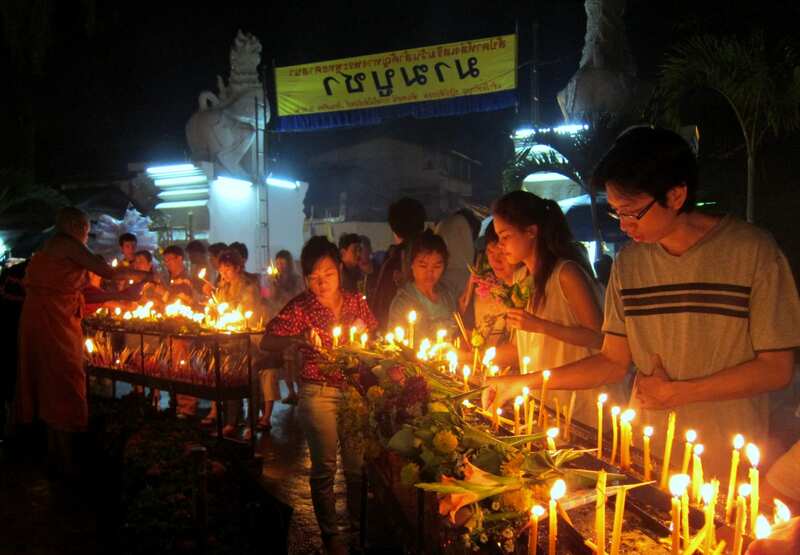 February 18 was Makha Bucha day, one of the more important holidays in Theravada Buddism. Celebrated on the third lunar month’s full moon, it marks the Buddha’s first sermon to his disciples (known as the Ovādapātimokkha) nine months after his enlightenment. There were 1,250 disciples in attendance and Makha Bucha celebrates not only the sermon but the fact that none of the disciples were summoned; they spontaneously showed up of their own accord. The day is a public holiday in Thailand, Laos and Cambodia, and living in Chiang Mai enabled me to watch the ceremony unfold as dusk fell.